Every Farm to Fork Dinner includes a Celebrity Chef contest. 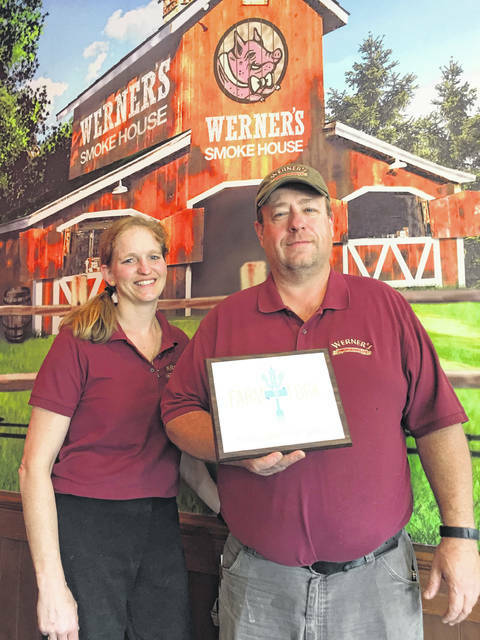 This year’s winners were Marsha and Jonathan Arnold from Werners BBQ with their tomato corn chowder and toasted corn bread recipe. Ingredients for the dish were provided by local vegetable growers. President of the Fayette County Farm Bureau, Lisa Peterson, and member of the Farm to Fork committee Kameron Rinehart present a check for $8,500 to Rose Avenue Community Center Director Greg Fessler and Assistant Director Melody Fessler. Children from the afterschool program surround them. 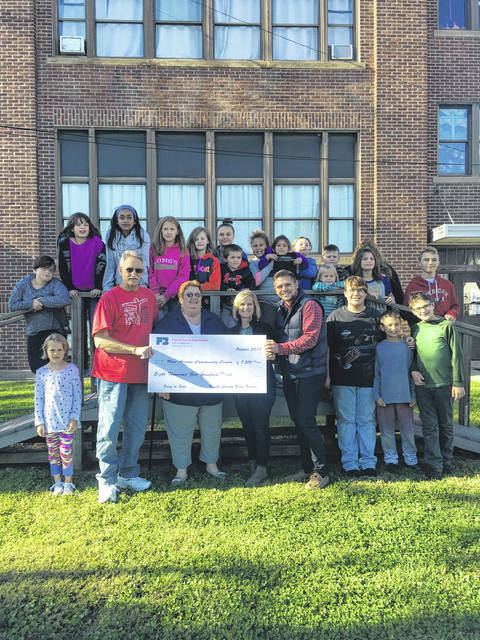 On Wednesday, a check for $8,500 raised by this year’s Farm to Fork dinner was presented to the Rose Avenue Community Center in Washington C.H. The Farm to Fork Dinner is an annual event that brings members of the community together at a different local farm each year. There, they enjoy a meal made from locally grown and raised farm products. The money raised by this dinner is donated to a local nonprofit each year. Rose Avenue is a part of the extension ministry of Heritage Memorial Church. Rose Avenue offers a wide range of services to the community, including: an afterschool program for children every weekday from 3 to 5 p.m., a food pantry, free clothing and hygiene products, and more. Additional information about everything Rose Avenue has to offer can be found at heritagewch.com/rose-ave. In addition to the $8,500 raised by the dinner, $1,850 was raised by the auction that was held during the dinner. This money had already been given to Rose Avenue, and the center’s director, Greg Fessler, said it was mostly used to update the kitchen. Rose Avenue serves hot meals to members of the community six days a week. https://www.recordherald.com/wp-content/uploads/sites/27/2018/10/web1_IMG_9877.jpgEvery Farm to Fork Dinner includes a Celebrity Chef contest. This year’s winners were Marsha and Jonathan Arnold from Werners BBQ with their tomato corn chowder and toasted corn bread recipe. Ingredients for the dish were provided by local vegetable growers. https://www.recordherald.com/wp-content/uploads/sites/27/2018/10/web1_IMG_2569.jpgPresident of the Fayette County Farm Bureau, Lisa Peterson, and member of the Farm to Fork committee Kameron Rinehart present a check for $8,500 to Rose Avenue Community Center Director Greg Fessler and Assistant Director Melody Fessler. Children from the afterschool program surround them.